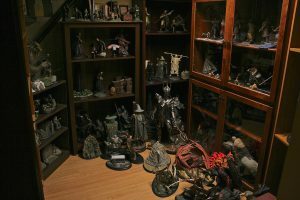 It seems a long time ago that we first let you know about Lootcrate’s exciting Lord of the Rings crates. At last they are nearly here! If you want to join the fun for the first of the three crates, you need to sign up by March 30, (though should you miss that deadline, you can still sign up later for the subsequent packages). Full information can be found on Lootcrate’s website. The good folks at Lootcrate have given us an exclusive reveal of a premier item which will ship in the first crate! The beautiful, stoneware Prancing Pony stein (below) is 12.7cm tall and 10.5cm in diameter. It features the pub logo on a medallion on the front. It’s a really lovely, weighty item of high quality, which feels great in the hand, and will make you feel like you’re back in Bree enjoying a pint after a hard day’s work (if you’ve ever done a hard day’s work…) This gorgeous collectible is exclusive to Lootcrate, and is just one of the treasures you will receive in the first crate! 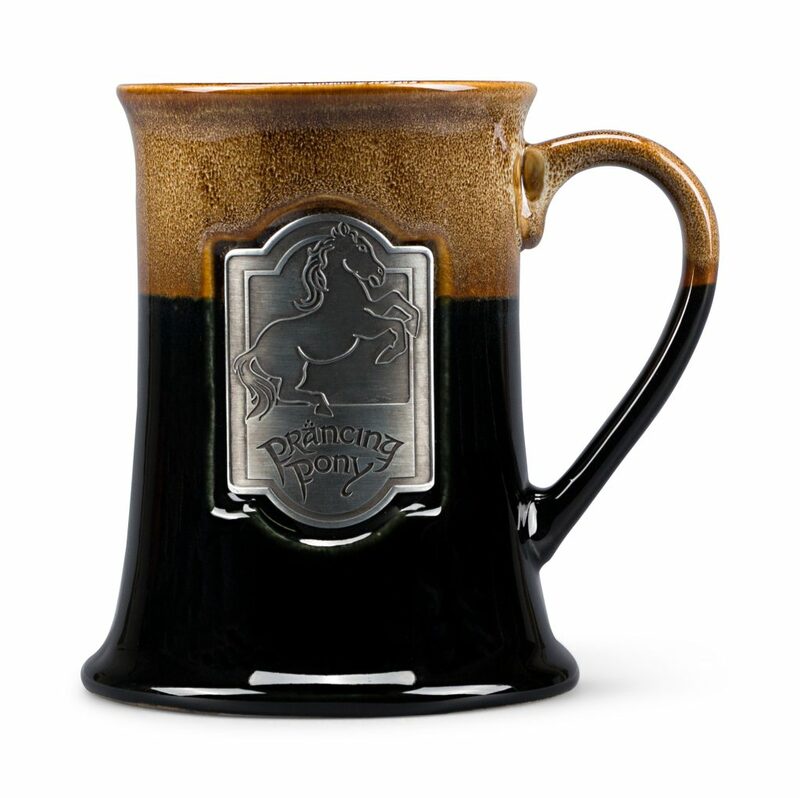 You can only get this stein if you sign up for the first Lord of the Rings one time only, limited edition crate. You only have five more days to sign up; don’t delay! 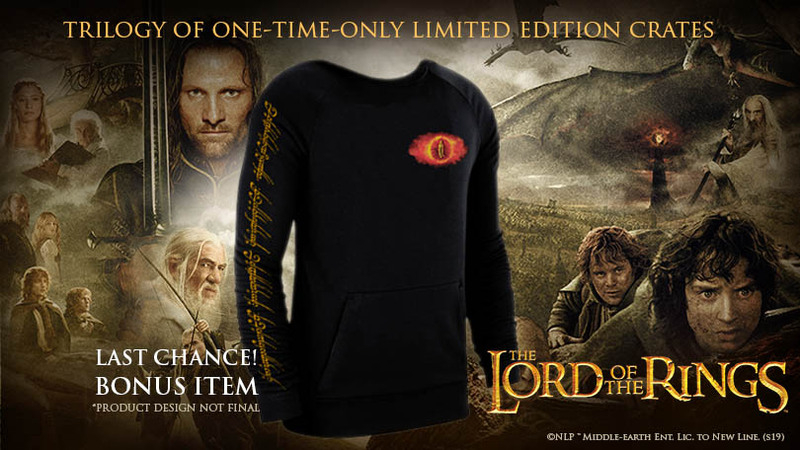 Lootcrate extends special gift offer with Lord of the Rings crates! 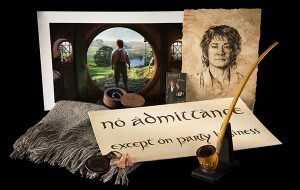 In our Holiday Gift guide this year we let you know about Lootcrate’s exciting Lord of the Rings crates, which will be coming out next year – but are available for pre-order right now! The good folks at Lootcrate have contacted us to let us know that they’ve had such a great response, they’ve extended their special offer for those pre-ordering the complete set of three boxes. Order the trilogy of crates – which will contain fabulous, new Lord of the Rings merchandise – and while supplies last, you’ll receive an exclusive fleece pullover. More information can be found on Lootcrate’s website. If you’re still doing last minute gift shopping, check out our Holiday Gift guide for more great ideas! 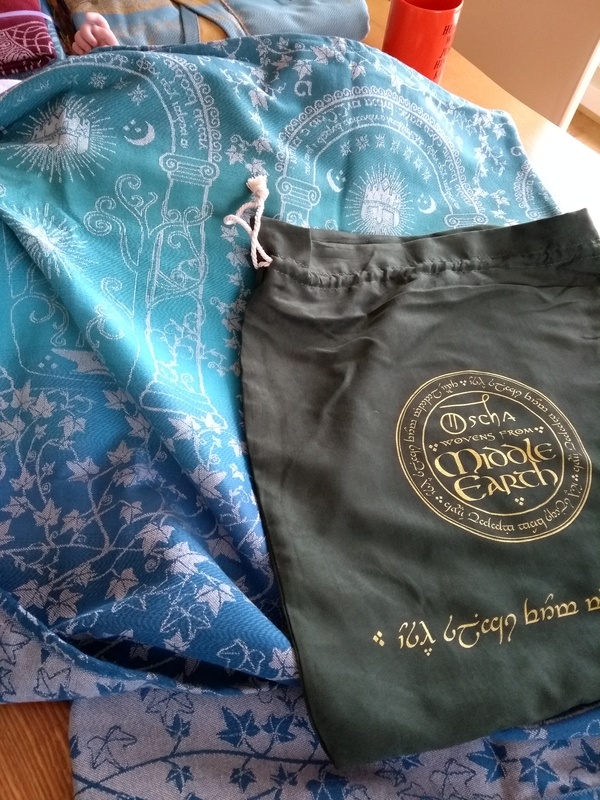 You’ll remember a while back we brought you news of the lovely Middle-earth inspired collection from the good folks at Oscha Slings – stunning throws, scarves, baby wraps and even mugs, all crafted with incredible elven, dwarvish and hobbity designs. In our Holiday Gift guide we mentioned that there is now clothing available from Oscha – and we want to make sure you all know about it! 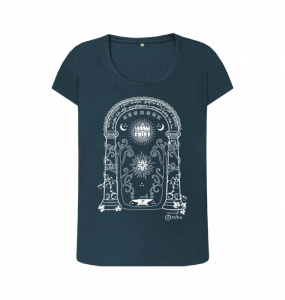 They have joined forces with Teemill to create some gorgeous tshirts, tops, hoodies, bags, and more. 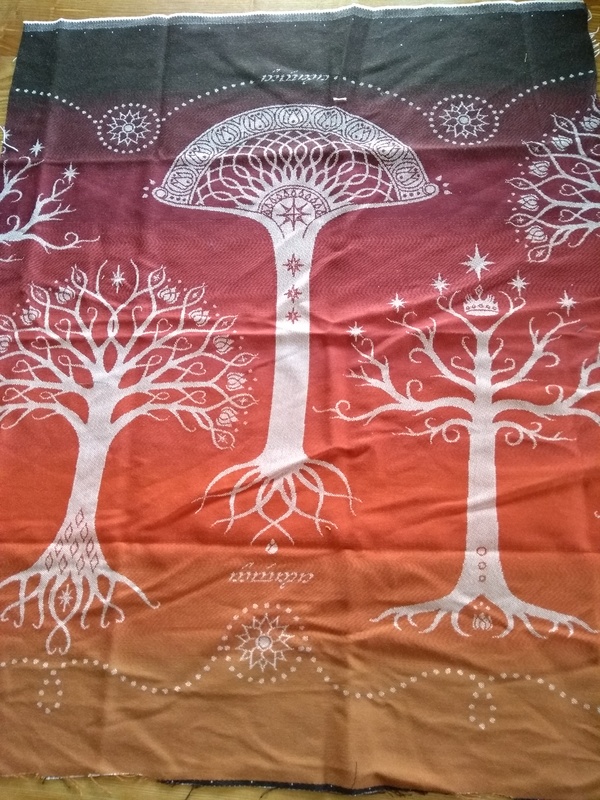 If you’re looking for something beautiful and original for the Tolkien lover in your life (or even just for yourself), then you should definitely check out their amazing products. 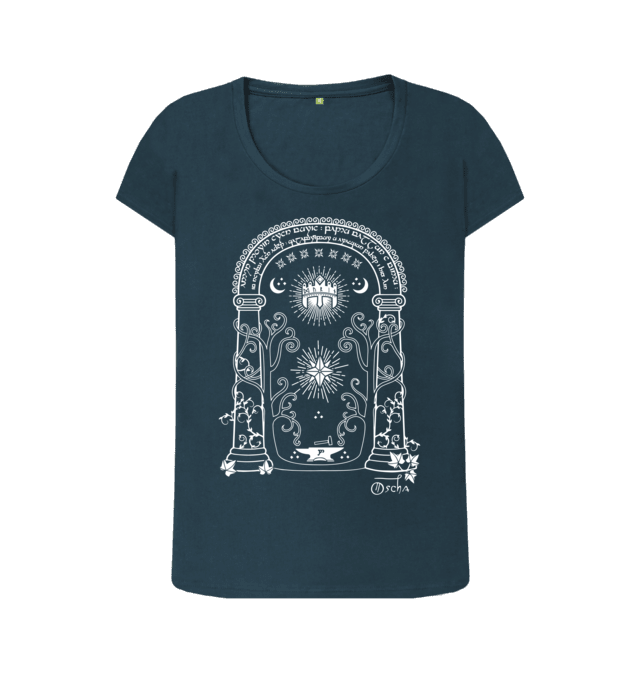 (The image shows their Doors of Durin design, just one of their hand-drawn illustrations.) Even better, all their products are made using 100% certified organic cotton, renewable energy, and minimal waste technology. Quick delivery is available – but the last order date to have your goodies in time for Christmas is fast approaching, so don’t delay! 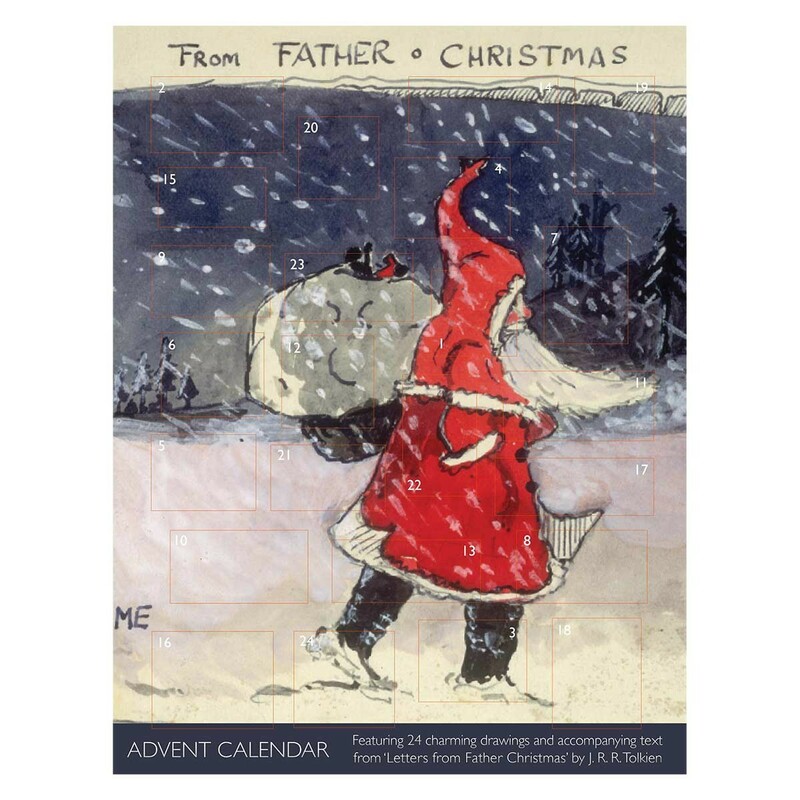 Check out our Holiday Gift guide for more ideas. 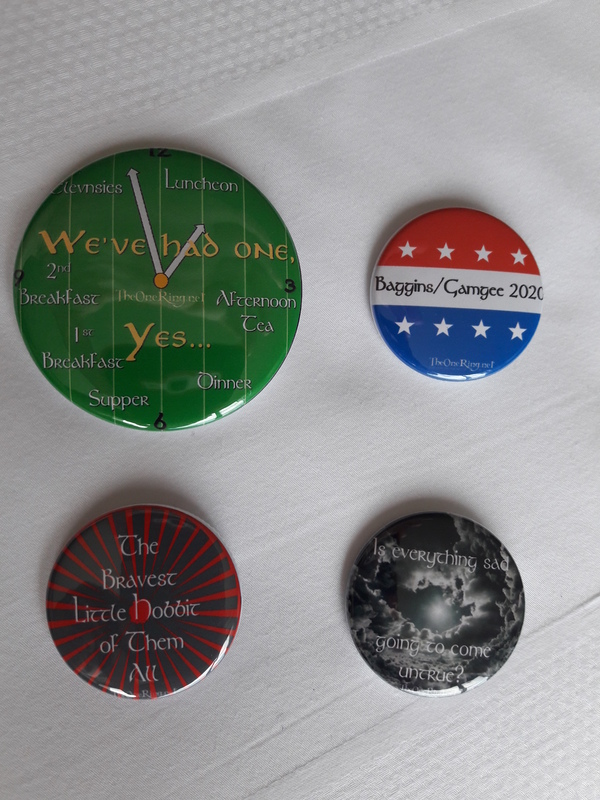 DragonCon is upon us! 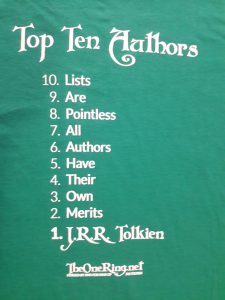 And TheOneRing.net is there! 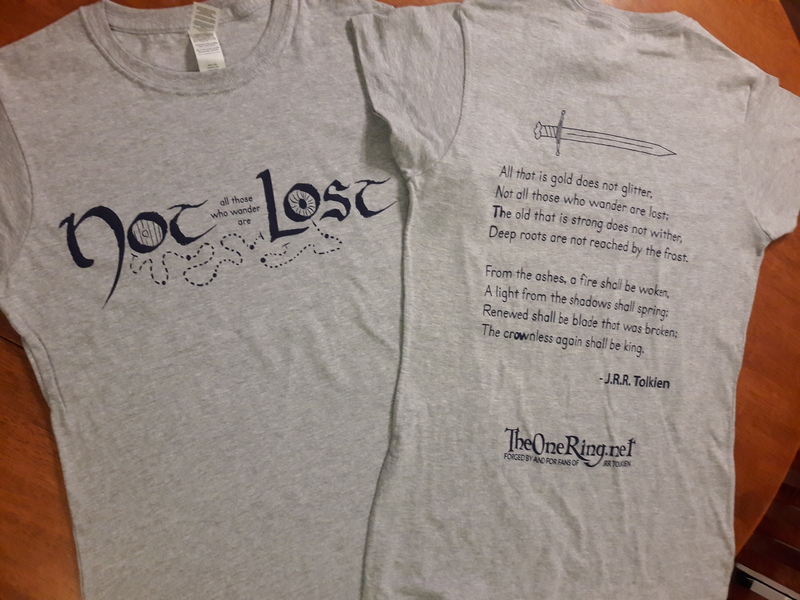 We’ll also have other goodies for you to look at, maybe a few giveaways, and we’ll be happy as ever to chat with our fellow fans! 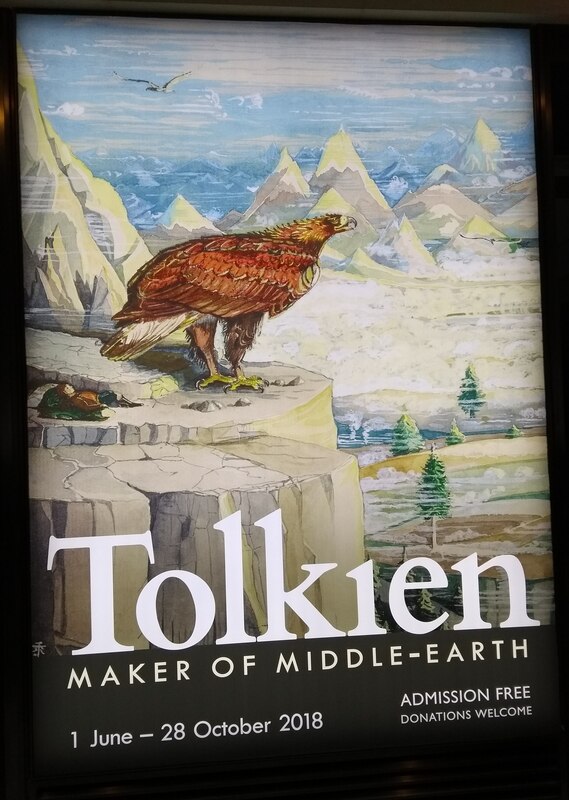 The High Fantasy track will be in L401-403 in the Marriott, and there are various panels which will be of interest to Tolkien fans; such as a discussion about The Inklings (Saturday 2.30pm), ‘Valar-ous Women of Middle-earth’ (Sunday 5.30pm), and TORn’s own ‘They’re taking the Hobbits to Amazon!’ panel (Sunday 4pm, in a bigger room – Marriott A601-602). Middle-earth celebrity guests this year are Graham McTavish (Dwalin), John Noble (Denethor), Dean O’Gorman (Fili), and Craig Parker (Haldir). On Sunday morning, 11.30am in the Marriott Imperial Ballroom, TORn staffer greendragon will be hosting these gentlemen in the ‘Heroes of Middle-earth’ session. In addition to all that, there will be lots of Tolkien characters marching in the Parade on Saturday morning, and there will be all the usual opportunities to spend far too short a time among such excellent and admirable fans! Hope to see you there – let the fun begin! Oscha Slings – fabrics of special magnificence! 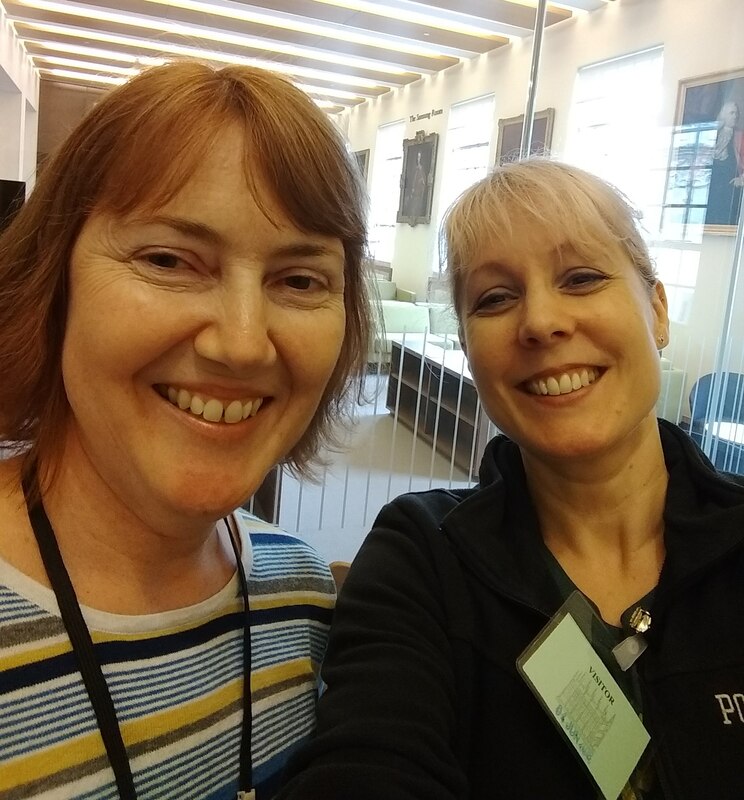 Earlier this summer, TORn staffer greendragon had the great pleasure of going across to Edinburgh to meet with the good folks at Oscha Slings, a Scottish company who are our fellow licensees with Middle-earth Enterprises. 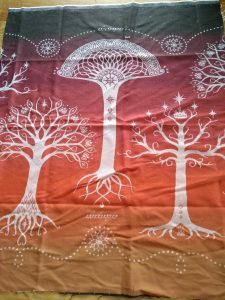 This company, created by a father and daughter who are both big fans of Tolkien, makes beautiful fabrics, primarily for baby wraps, but also for wonderful throws, scarves and bags. The company started after daughter Zoe fell in love with using a baby sling with her own children. She wanted to support parents who like the ‘baby wrap’ way of carrying (or even ‘wearing’!) an infant, and felt that most fabric designs were based on what the children would like, rather than what parents might like to wear. There was a gap in the market for elegant fabrics, and so Zoe and her graphic designer father began creating celtic, mythical and art nouveau weaves. 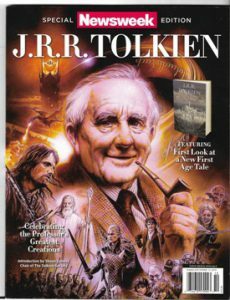 As big fans for Middle-earth, they were delighted to be able to secure a license from Middle-earth Enterprises, and so begin dreaming up amazing designs, in a variety of art styles to represent the different races of Tolkien’s realm. All of Oscha Slings fabrics are designed in Scotland and woven in England. They source their materials in the UK as far as is possible, and always make sure that anything they use is cruelty free, as organic as possible, and uses no harmful chemicals. (The company feel strongly that being as ecologically friendly as possible would be approved of by the Professor.) 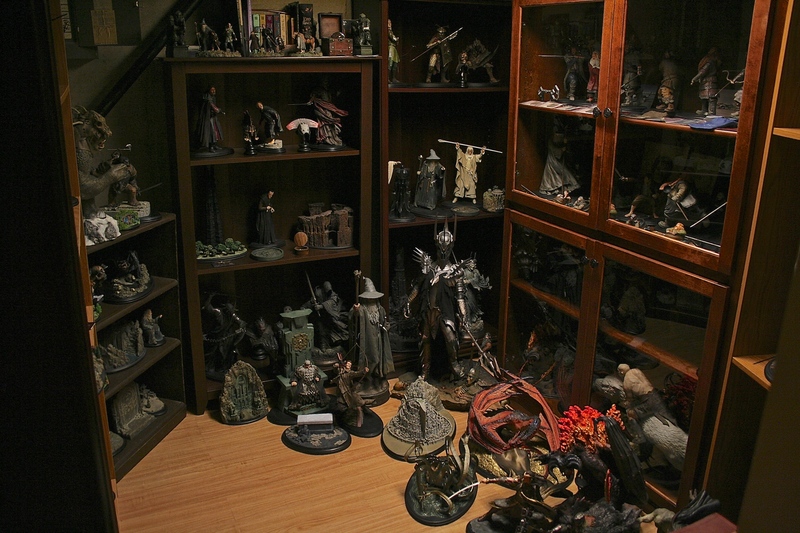 They have an army of fans, and when you see their incredible work, it’s not surprising! Many of the baby wrap fans are also Tolkien fans, and they are very vocal about what they want to see; one fan even designed a Mithril pattern for Oscha Slings! They have very active fans on Facebook, and 35,000 members in their international fan-run community – they’re no strangers to passionate fan bases! Oscha also have plenty of items for those of us who don’t have babies to transport! Fans have even been known to hang their fabrics on the wall, as beautiful tapestries. 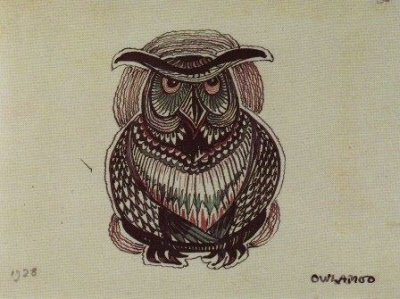 Others have ordered smaller pieces of the fabrics to use for their own quilting projects. We’re hoping to have some goodies from Oscha Slings for fans to look at (and maybe even take home) at DragonCon and New York ComicCon this year. Meanwhile, you can check out all the gorgeous items available at Oscha Slings here. Hobbits, Elves and Humans can toast together this Holiday Season! 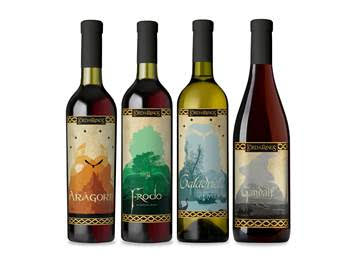 Lot18 and Warner Bros. Consumer Products unveil the new Lord of the Rings inspired wine collection. Just in time for holiday merrymaking, Winemaker Lot18 has teamed up with Warner Bros. Consumer Products to produce a limited-edition collection of wine inspired by New Line Cinema’s THE LORD OF THE RINGS Trilogy. Posted in Events, Headlines, Lord of the Rings, Merchandise, Miscellaneous, Other Merchandise, Shop, TheOneRing.net Announcements, TheOneRing.net Community, Warner Bros. 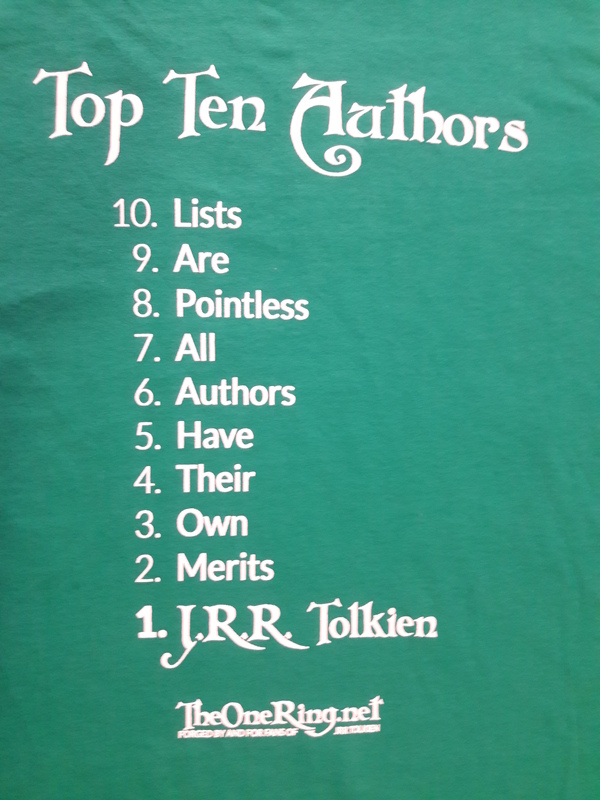 Still haven’t found the perfect gift for the Tolkien fan in your life? Let us help! We’ve assembled a list of our favorite items and where to find them. 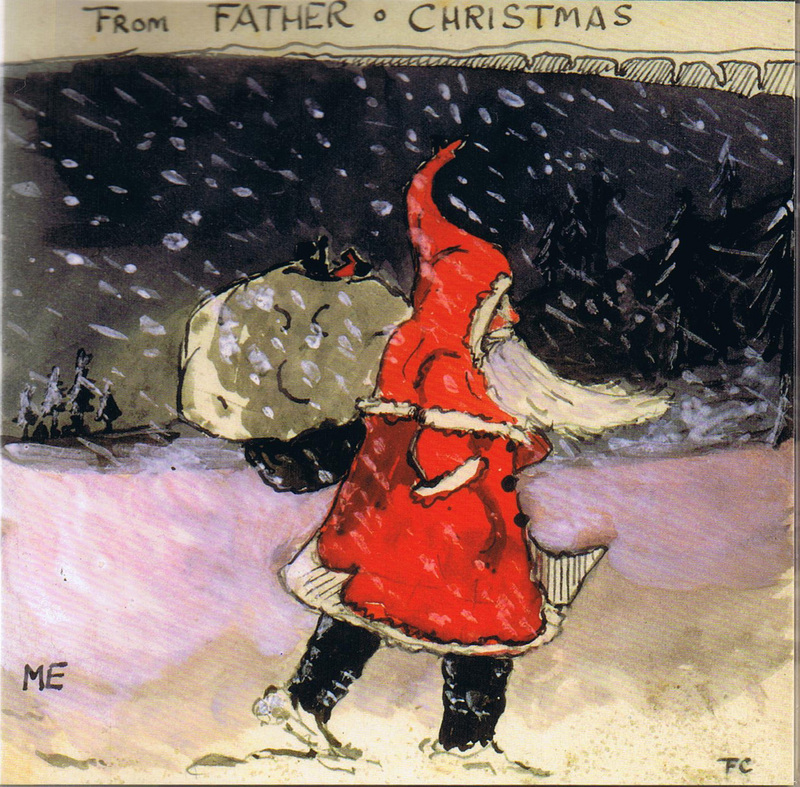 Happy Holidays from all of us at TheOneRing.net! *Prices listed are in US dollars ($); prices may vary from what is listed. The package is priced at $229 USD, but contains $368 USD worth of everything you need to enjoy Bilbo and Frodo’s birthday long after September 22 has come and gone. Speaking of September 22 coming and going, the package is available through September 29 at midnight New Zealand time, a full week after the big birthday event. You can place your order here. Still wondering what to get the Tolkien fan in your life for the holidays? Let TheOneRing.net help! Staffers deej, Earl, Elessar, Kelvarhin, and Sarumann have compiled a list of some of our favorites.